Can I Earn an Online Degree While in Active Military Service? Online degrees for active military men and women refer to degree programs that let you earn your degree at the same time that you defend your country. Prior to the widespread use of the Internet, schools offered distance learning programs that required students complete assignments and use workbooks that they sent back to the school. With online classes, you now get the same experience that you would in the classroom. As not all programs are the same, it’s important that you know everything you need to know about online programs for military personnel. A common question that many students ask is about what they can study. There is no limit to what you can learn in one of these programs. No matter what your interests are, the odds are good that there is an online program out there for you. Many students major in history, psychology or computer science. They look for programs that will assist them after they leave the military and for programs that will help them advance in the military. Most programs require that you take general education courses and specialized courses in your major. How Do Online Classes for Military Personnel Work? 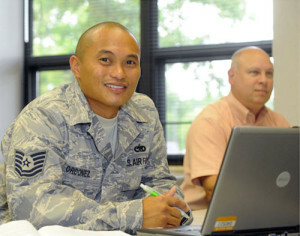 Online courses for active military are similar to those taken by other students. You must show that you have access to the Internet and a computer that has the right features and software needed for your program. Most courses ask that you log into your account several times a week to post answers to discussion questions and responses to questions and comments posted by other students. You’ll also have the chance to take quizzes and tests online. Military programs give some leeway to students and may give you more time to finish your assignments due to your military service. What happens when you leave the military before finishing your degree? Some students remain in online programs, but other students transfer to a community college or university in their home cities. A good military program will have accreditation that lets you transfer your credits to another school. As long as the traditional school you attend has similar courses and require those courses for graduation from your program, you shouldn’t have a problem transferring your online courses into a new program. Not all online degrees for active military have the same features as others, and not all degree programs will help you in the real world. That is why you should look for some specific things when choosing a military program. Kelsey Sheehy of U.S. News and World Report recommends looking at the support services that the school has in place. A reputable program will have tech support available to students who have problems using the online system, and many programs will also offer support to students who need career assistance after graduation. You’ll also want to consider whether the school has accreditation from a reputable organization. As an active member of the military, you know that you might ship out at any moment. The best online programs will support you during your travels. There are a number of online degrees for active military men and women that can help you earn a degree before you leave the military, but you’ll generally want a program that offers support and has accreditation.